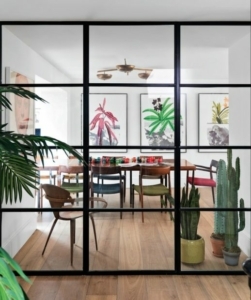 One of my favourite trends of 2019 is the Crittal doors. Edgy and versatile, the sturdy, slim-profile frames tap into the current trend for all things industrial. It’s no wonder Crittal-style has been dominating our Pinterest feeds. They allow you cleverly partition open areas to differentiate zones without compromising on light or space. 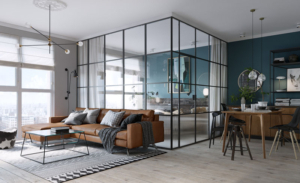 They have the ability to completely transform a space; not just by giving it a cool, modern edge but also by opening up a space and letting in more light. 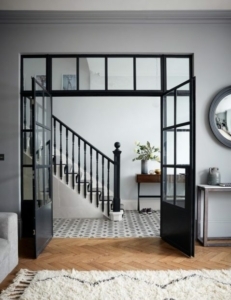 Originally developed in 1889 by Essex ironmonger, Francis Henry, the name has become generic for black steel – framed windows and doors. 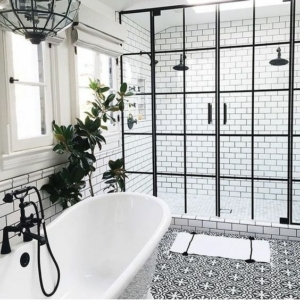 I think applications as shower screens are even cooler than partitions in living rooms.